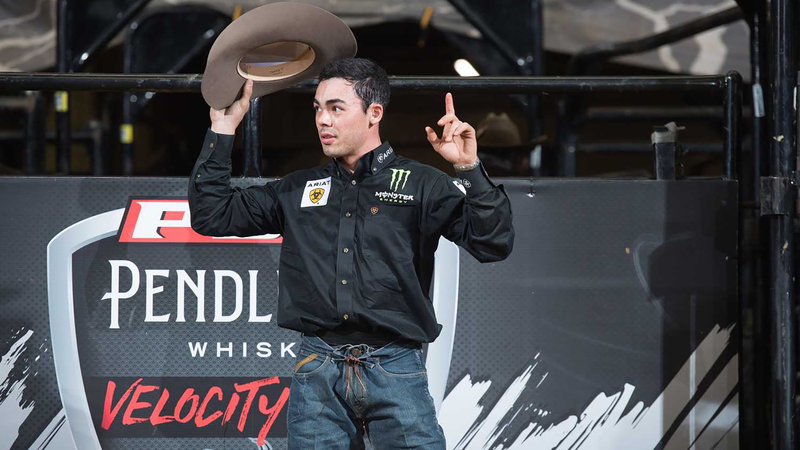 Wheeling, W.Va. – West Virginia fans cheered inside of Wesbanco Arena as PBR’s (Professional Bull Riders) Marco Eguchi (Poa, SP, Brazil) won Round 1 of the Pendleton Whisky Velocity Tour’s Neighborhood Ford Store Challenge. The 2018 PBR World Finals event winner captivated the crowd with his 87.5-point ride aboard One Boot (Sho-Me Rodeo) on Friday night and collected 50 world points. Eguchi, who currently sits in the No. 48 spot in the world standings, was a man on a mission determined to make his weekend on the west coast count as he makes his climb back to the top of the world standings. North Carolina cowboy Eli Miller (Statesville, North Carolina) finished in second place for the weekend’s opening round. He made the 8 seconds aboard Roll of the Dice (Sustaire/Barrett Willis Bucking Stock LLC) to record an 86.5-point ride score and collect 25 world points. Scottie Knapp (Edgewood, New Mexico) fired out of the Wheeling chutes aboard Resident Evil (JQH Bucking Bulls- Skip & Elaine jones) to earn an 84.5-ponit ride score. His Round 1 efforts resulted in 10 world standings points. In a three-way tie for fourth place, Rubens Barbosa (Iaciara, Brazil), Derek Kolbaba (Walla Walla, Washington) and Josh Goodson (Atlanta, Georgia) recorded equal ride scores of 84 points. Early in the evening, Goodson exploded from the chutes aboard Hy Test (Phenom/JCL/Swalin/Goods Bucking Bulls/Sankey Pro Rodeo) to get the crowd on its feet. Barbosa, on the hunt for world standings points made the whistle aboard Last Tango (CBT 4 Barrett Willis Bucking Stock LLC), while Kolbaba covered Force Awaken (Jane Clark/Gene Owen) in an effort to add to his world standings points throughout the weekend. Fans will be able to watch all the action from Wheeling each night on RidePass.com or via the RidePass mobile app. Round 1 can be viewed beginning on Saturday, March 16 at 8 a.m.
1. Marco Antônio Eguchi, 87.5-0-0-87.50-50 Points. 2. Eli Miller, 86.5-0-0-86.50-25 Points. 3. Scottie Knapp, 84.5-0-0-84.50-10 Points.